We've talked for the last few days about believing beautiful about our bodies, now we are going to talk about believing beautiful in our homes. 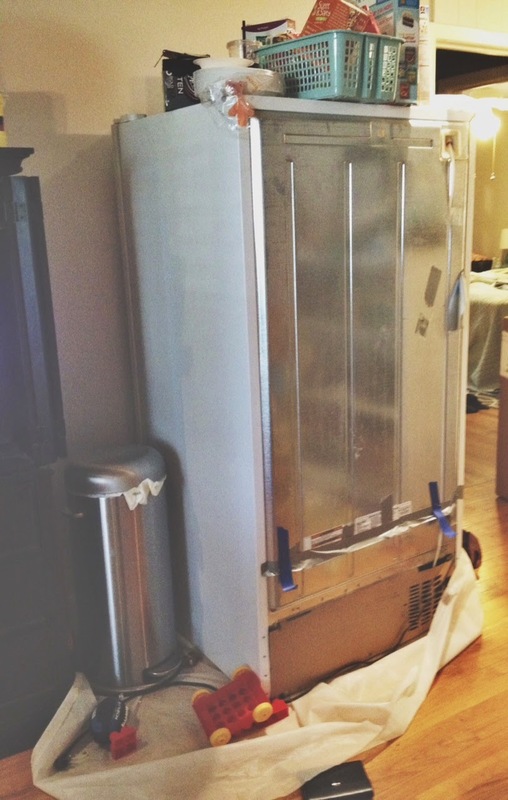 Right now, I really need some perspective about this because I quite literally have a refrigerator in my living room. We are beginning (ending, in the middle, I-don't-know-anymore) to fix up our kitchen in the house we bought in June. You can see more about the kitchen here and here. Right now, our living room is filled with pantry food, a cooler, a dormant refrigerator, and what seems to be mounds and mounds of junk. Especially when your living room isn't gigantic to begin with, I am starting to feel like my house is caving in on me. But, this is the way it is. We hope to be finished tiling the floor by this weekend (please, please, please), but in the meantime, we are stuck here. It's easy for me to get so distracted by the non-fun of it all. It's easy for me to complain. It's easy for me to nag and nag at my husband about finishing the floor. It's easy to sit in my living room and feel like our home is never going to be beautiful--that, instead, it will be untidy, unfinished, and unpresentable. Right now, today, it kinda is. But even in all this un-ness, I want to see beauty. For isn't there beauty in the fact that we have a home, that we have a place littered with a toys and a boy to play with them, and food to eat (even if it is canned soup and peanut butter sandwiches)? Yes. Yes. And yes. So, when I'm tempted to just see the unbeautiness (yep, I just made up that word!) of it all, I want to replace that with contentedness--even in the worst of it. Love this! I know how you feel. We live in a much smaller home than the one we used to live in and we have too much stuff and not enough space. On top of that my husband purchased a piano and things had to shift. Then, recently they shifted again as we decided he needed a bigger music room (read: I gave up my workroom). All my stuff was crammed into the kitchen to be dealt with. Then, on top of that we had a new furnace installed and all the utility room junk moved into the kitchen for a few days. I'm still digging out from under all the plastic totes and stuff. I have found a corner in the kitchen that is my new workspace, but I"m so over the chaos. Thanks for the reminder to see the beautiful. It is cozy and my desk is by the window and I have a plan of action which needs to be pretty much implemented by 3 pm tomorrow when the piano students start arriving. Whew! Life is messy beautiful isn't it?